Free-to-play MMO powerhouse, Aeria Games is looking to bring yet another title to the US and EU-based audience later this year. 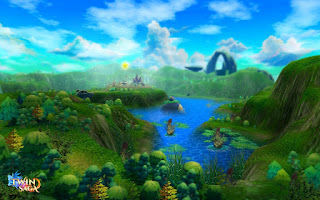 Twin Saga will certainly be a major hit with anime-fans: set in a colorful, cartoon-like world, featuring anime characters and monsters, the game - which otherwise delivers a fairly run-of-the-mill PvP and PvE experience-tandem - comes with a few rather unique selling points. One of these is mobile housing system. Called "Terracottage", the house, which serves as home base for player characters, is a sort of a steam-powered terrarium, which roams around the continent on which the game is set. The Terracottages can be customized and they act as the center for player professions and crafting skills. An alchemy lab can apparently be added to them, as well as a cooking station and a greenhouse. The story behind the game is delightfully corny: Marissa and Amaris are twin-goddesses who are the opposites of one-another in every respect. One of them, Marissa, advocates that humanity should be allowed to survive past the end of time (exactly how that would happen is unclear, but also quite unimportant in terms of the in-game storyline), while Amaris apparently just wants everything to end. When the forces of evil are on the brink of victory, the player shows up as a frail human, trying to forward the cause of survival and turn the tables. According to Aeria Games' Tom Nichols, the game also features freely swappable classes, as well as a deeply immersive - and visually quite pleasing - world. The developer of the game is X-Legend Entertainment, a company that's already produced a number of successful titles for Aeria Games. For the time being, there is no actual US and EU release date set for Twin Saga. Philip Thalberg works for Gosugamers, the home of the world's top Overwatch community.